In the days following the radio interview, Mefferd published two further examples of plagiarism, where Driscoll had copied sections from a theology book, the New Bible Commentary, edited by Don Carson and published by IVP in 1994. 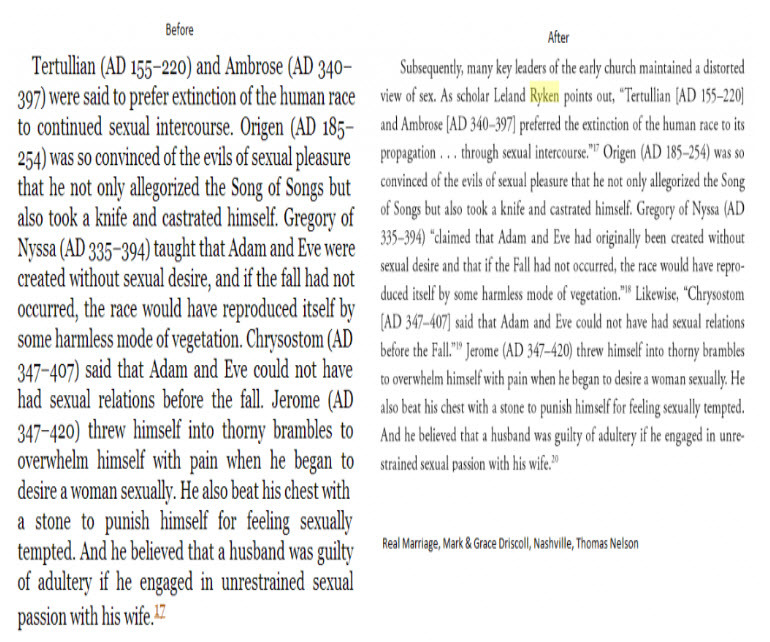 The evidence was posted online and showed that whole paragraphs from the New Bible Commentary appeared in Driscoll’s book, entitled Trial: 8 Witness from 1 & 2 Peter. Quote from Warren’s blog: ‘To help compare one of the passages from Trial: 8 Witness from 1 & 2 Peter, I have reproduced the relevant section of New Bible Commentary on I Peter from Mefferd’s materials. Then I looked up the web copy of Trial on Driscoll’s website. The side by side comparison is below. The bold print highlights the words that have been changed or altered in some manner from the original. A few days after these events, the internet world was stunned when Mefferd publicly apologised to Driscoll for her conduct during the interview, and deleted from her website the evidence of plagiarism. She even removed the radio transcript of her interview. It seemed like an attempt to create the impression that the interview had never taken place. But the horse had already bolted, for some people had already made copies of the evidence, which was posted onto other websites. The reaction of some was that Mefferd had been got at by the Driscoll PR machine. The sudden resignation of Ingrid Schuelter, from the Janet Mefferd Show, added to the drama. In an attempt to defend Driscoll’s position the Mars Hill website published a post to say that the book Trial: 8 Witness from 1 & 2 Peter, in which Driscoll was accused of using plagiarised material was never sold, and so it was not really plagiarism. But Mars Hill had made a careless mistake, for the book in question was at the time being advertised for sale on the Mars Hill website. Having been made aware of their ‘mistake’, the website quickly removed the words, and was never sold from their post. Several paragraphs from the New Bible Commentary edited by G. J. Wenham, J. A. Motyer, D. A. Carson and R. T. France published by InterVarsity Press appear in Mark Driscoll’s now out of print book Trial: 8 Witnesses From 1 & 2 Peter. These improperly appeared without quotation or attribution. With proper citation the material would have been a case of fair use. InterVarsity Press believes all writers should use great care as they do research and prepare texts for any use to make sure that proper acknowledgement is given to source material. The above is a brief account of the story that is widely reported on the internet. The best accounts are by Warren Throckmorton and Jonathan Merritt. But matters only got worse for Driscoll, as it was now widely known that he was a serial plagiariser. In January 2014, Warren Throckmorton pointed out that a section of Real Marriage by Mark & Grace Driscoll seemed quite similar to a passage from Leland Ryken’s book Worldly Saints. The publisher, Harper Collins Christian, has now corrected the section in question by quoting and footnoting the section of Ryken’s book. The evidence quoted above leaves little doubt that Mark Driscoll, the author of many ‘Christian’ books, is a serial plagiarizer. The significance of Driscoll’s plagiarism is that it reveals much about his character. It seems he is prepared to use other people’s intellectual work and writings, and pass them off as his own—plagiarism is dishonest. Scripture demands high standard from those who teach God’s Word. ‘Not many of you should become teachers, my brothers, for you know that we who teach will be judged with greater strictness’ (James 3.1). By his conduct, Driscoll is dishonouring the Christian Faith. A true Christian is to be ‘blameless and harmless, the sons of God without rebuke, in the midst of a crooked and perverse generation’ (Philippians 2.15).